Please note that this new division is under development and may be subject to changes. Please keep checking back. 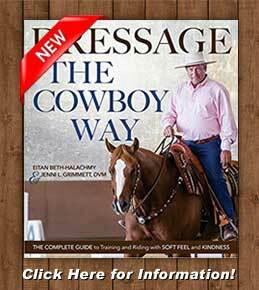 Riding for the Brand combines the most challenging of Cowboy Dressage World Competitions. Each test is an “art form” that also requires strong horsemanship skills both under saddle and on the ground. By asking competitors to exhibit their skills in three horsemanship categories: Partnership on the Ground #2, Walk Jog Lope Challenge #2 and Walk Jog Lope Open Freestyle the horse and rider will be tested on their skilled versatility. We are excited to include the Open Freestyle in this mix as it allows for their creative partnership to shine…the Cowboy Way. 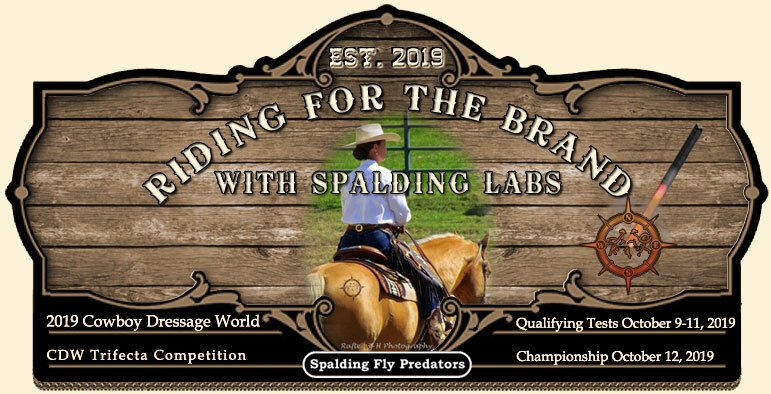 The Riding for the Brand Trifecta is open to Amateurs, Open Riders, Clinicians and Professionals. All riders must be 18 years or older. Riders may enter more than one horse. If a rider has more than one horse in the Top Five, then the highest scoring horse must be ridden. Walk Jog Lope Freestyle must salute at beginning and end of test. All Riding for the Brand Walk Jog Lope Freestyle music must be turned into office on Tues by 5 pm. Sound tests will be Wed at 7 pm. Place to be determined. All music must be on thumb drive or CD with only one selection of music. If there is championship music that is different it must also be on a separate thumb drive or cd. No multiple music on either. This must be labeled for qualifying test or championships. Riders name must be on them . Qualifying Tests to be held during show days. 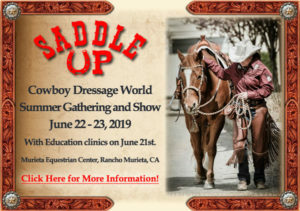 These will be specialty classes and for Riding for the Brand Entries only. The Top 5 riders for Finals to be posted by 7 PM on Friday Oct 11th. The 6th place winner should be on stand by for the Championship Competition. Championship starts Sat. Oct 12th after dinner in arena 1. Approximately 6:30 PM. Awards will be given one hour after the competition ends on Saturday evening. A total of the percentage scores of all three tests for each horse/rider combination will be used for placings of the top five riders for the Championship. Two tests will be ridden by the top five. Both percentage scores will be combined for the Champion. All Cowboy Dressage World Rules will apply. cowboydressag.com/competition.html; if there is a conflict in Rule Verbiage – these Rules take precedence. Same horse and rider combination must compete in all three qualifiers to be eligible for the Championship. Substitutions of a horse and/or rider is allowed ($100 substitution fee) up until Tuesday, October 8 th at 5:00 p.m. with veterinary excuse or approval by CDW Partners. Refunds only before entry closing date with written veterinary or Doctor’s excuse. No refunds after entry closing date. All exhibitors should check our Rules and Guidelines page for new rules for 2019. All riders must supply a photo of themselves and their horse with a short Shirt size is a must too. Entry will not be considered complete without these. Send photo, shirt size and bio to Debbie Beth-Halachmy at: eitanndeb@gmail.com. In Subject line put: Riding for the Brand. This information is due at close of entries. 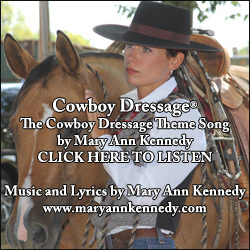 All this will be listed at: cowboydressageworld.com. Entries and release will be on a separate entry blank. 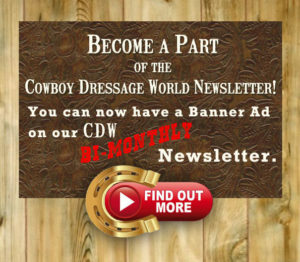 All entries bios, pics and profiles will be featured on Cowboy Dressage World Website. Tuesday, Oct 8th 5 pm. Meeting of all riders at show office. Shirts to be handed out. Arena and times to be determined. 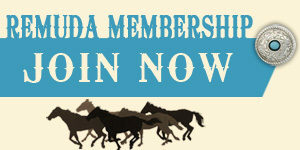 Placings will be calculated by percentages, not points for Riding for the Brand competitions. The combined score of the 1st and 2nd Go (Mystery test and Freestyle) will determine the placings for Champion. The previous Qualifying score is not counted in final Top Five Placings. 50% of the score is on general impression: Soft Feel, Partnership and Harmony. 50% of the score is based on technical merit. Freestyles must salute at beginning and end of test. Top Five Horses will have time to familiarize themselves with arena during Calcutta but cannot go inside the court. Top Five Horses cannot leave the arena. Each rider will have 45 seconds after the bell to enter the arena at A and begin their test. Presentation of Awards – Sat PM following final ride. Upon completion of all rides, winners will be announced, and Calcutta winners will be announced. Riders do not have to be mounted during awards. In case of tie in the qualifying tests the highest combined soft feel score will be used from Riding for the Brand Walk Jog Lope Challenge test #2 and Riding for the Brand Partnership on the Ground #2. In case of tie in the Riding for the Brand Championship the top two will re-ride the mystery test for the tie breaking score. If there is a tie between 2-5 places then the same protocol as the qualifying tests will be used. Winning Horse to receive a big bag of carrots. Void after CDW Gathering and Finals 2021. Cowboy Dressage and Eitan Beth-Halachmy Facebook pages are an excellent source for event information and listings. 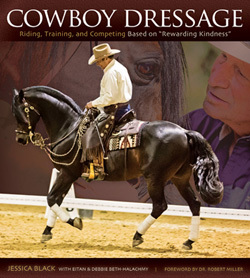 Cowboy Dressage Books Now Available. Click here for purchase. Did you all know that your show results stream “real time” at www.foxvillage.com? You can even use your mobile phone to grab your results, real time and get instant placing’s. Cowboy Dressage with Richard Winter’s Horsemanship. In case you missed the broadcast on Richard's RFD-TV show you can watch all 5 parts on the links below. 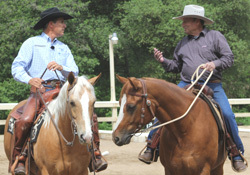 Enjoy Richard and Eitan as well as a cast of characters as they talk and ride Cowboy Dressage. 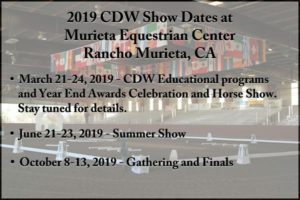 Please visit our Facebook Cowboy Dressage page for the latest news and current happenings, and our YouTube Channel for videos on Cowboy Dressage.